Happy Easter to anyone reading this! Dave has headed off to Maelstrom this weekend and reported in this morning, so I know he is still alive. He hasn't been eating though and was duly told to take time to have meals, preferably with proper breaks, involving a kettle, sitting down and actually stopping to catch his breath. Whether he'll take any notice of course is another thing, but at least he's not in danger of keeling over from heat exhaustion or sunstroke this weekend. With Dave out of the way, I drove up to Derbyshire yesterday to crew for a closed event being run by Ascendancy LRP. A closed event is one being run for a specific group of players, rather than an open event which anyone can book onto. We were running around Shining Cliff Woods (also fondly known as Shining Death), which involves a lot of hiking up and down hills over rough and boggy terrain. It isn't always boggy, but there has been a bit of rain lately and indeed, there were some heavy showers while we were there yesterday. Crewing also meant lugging heavy bags all over the woods and I even threw myself into combat encounters. Suffice it to say that today I ache; however, I'm fairly happy as even though my limp had returned by yesterday afternoon, I am moving fairly well today. Or at least I am so far. I'm pleased with the result and think they look pretty effective. 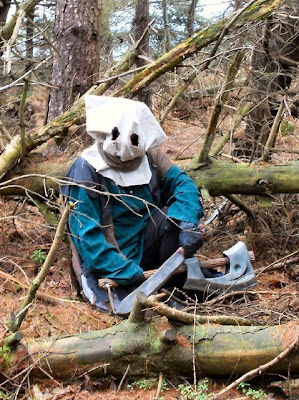 The masks themselves are simple bags (of linen/cotton) with holes cut for the eyes. I then crudely over stitched the eyes and seams with a linen thread, making the stitches big and obvious, to give a hand sewn effect. The over sewing also stabilised the fabric around the eyes and seams, making the masks easier and more comfortable to wear - I hope, as that was certainly the idea. Finally, a group shot of some of the crew kitted out as dwarves. Admittedly there are some very tall dwarves there, but look at the cool steamtech gun built by Richard! Not a bad way to spend an Easter Saturday, but today and tomorrow will hopefully be more relaxing! Crow masks were great (and very scary), apart from being slightly sweaty by the time I wore one.